Ajman University of Science & Technology prides in the team of five students, Youssef AlNajjar, Omar Mohammadi, Mohammad Nour, Hazem Alsarhan and Nour Ali from the College of Engineering who won the First Prize of AED 10,000 in Electrical Engineering Research at the Second United Arab Emirates Undergraduate Student Research Competition (UGSRC). Held under the Patronage of H.H. Sheikh Hamdan Bin Mubarak Al Nahayan, the competition was hosted by Abu Dhabi University in the presence of honorable dignitaries, government officials, sponsors and media. The aim of the competition was to recognize and promote outstanding student research being conducted at the academic institutions in the UAE and providing students with the experience of presenting their results in a nationwide competition. The research work presented by AUST team was about development of Brain-Controlled Electric Wheelchair. 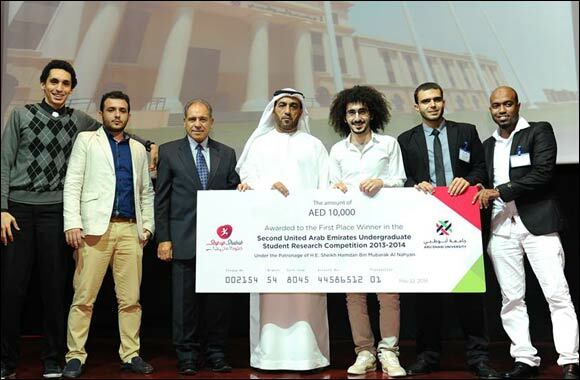 The five winning students explained their research project as follows. “The system developed in this research project is a brain-controlled robotic wheelchair built for handicapped persons, especially for quadriplegia patients who have partially or totally lost the ability to use their limbs and torso due to illness or injury in the spinal cord and who are therefore unable to use a conventional joystick. The developed system allows quadriplegia patients to drive the wheelchair using only the power of their thoughts; the patient thinks about where the wheelchair is to go and it heads in that direction. The research project was supervised by Prof. Mustahsan Mir, Head of the Department of Electrical Engineering at AUST. He explained that last year the project idea was presented to Al-Thiqa Club for Handicapped in Sharjah and the club management showed their keen interest in implementing this project by providing an electric wheelchair. He thanked Prof. Fahar Hayati, Dean of the College of Engineering, for his active support and encouragement for innovative projects by engineering students.